HOUSTON, Texas — Flags are being flown at half-staff across the country today in honor of Peace Officers Memorial Day 2018. Americans show their appreciation and respect for law enforcement officers, who spend every day working hard and sacrificing so that we can all live in safer communities. While Ted Cruz has consistently stood with law enforcement officers during his time in the Senate, Democrat Rep. Beto O’Rourke has spent his tenure in Congress voting in opposition of necessary resources for law enforcement in Texas. “Rep. Beto O’Rourke’s hostility to law enforcement stands in stark contrast to the priorities of Texans. O’Rourke thinks we don’t even need a fence on the border and lives in a fantasy world where the police who protect Texans from criminals don’t need proper resources to do their jobs,” said Cruz Campaign Spokeswoman Emily Miller. Cruz Background: Sen. Cruz is respected throughout Texas for his unwavering commitment to law enforcement. He introduced the “Back the Blue Act” in the Senate to make it a federal crime to kill (or attempt to kill) anyone in law enforcement. The bill would make the mandatory minimum sentence 30 years for murder and 10 for attempted murder of anyone in law enforcement. 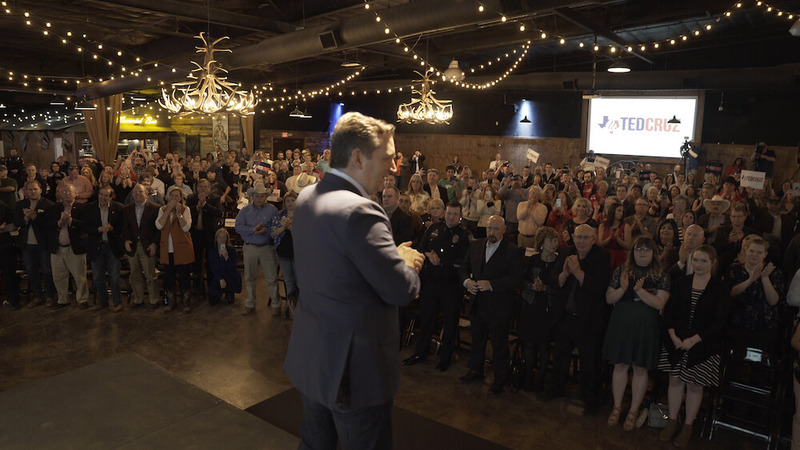 He also recently hosted a “Back the Blue” law enforcement appreciation event in Fort Worth in April for the colleagues and families of fallen police officers. O’Rourke Background: O’Rourke supported an amendment to the Homeland Security appropriations bill that would have reduced funding for Immigration and Customs Enforcement by $43.5 million. This included a $5.4 million reduction for the important 287(g) program, which trains state and local law enforcement officers to enforce federal immigration laws — a key tool for law enforcement agencies in border states like Texas. He voted against the “Faithful Execution of the Law Act,” which was an attempt to stop President Obama from ignoring federal laws on criminal justice and immigration. O’Rourke voted in favor of a bill that would prevent funding for the Defense Department’s Excess Personal Property Program. This federal program had provided law enforcement in the El Paso area with over $9 million in equipment, including 156 units of body armor for the sheriff’s office; 90 night vision units for the local border patrol; helicopters for the city police and border patrol; and other items such as trauma gear, fencing, and generators. In addition, O’Rourke voted against legislation that included border security activities on the list of preferred applications the Defense Department should consider when transferring excess property to other federal agencies.